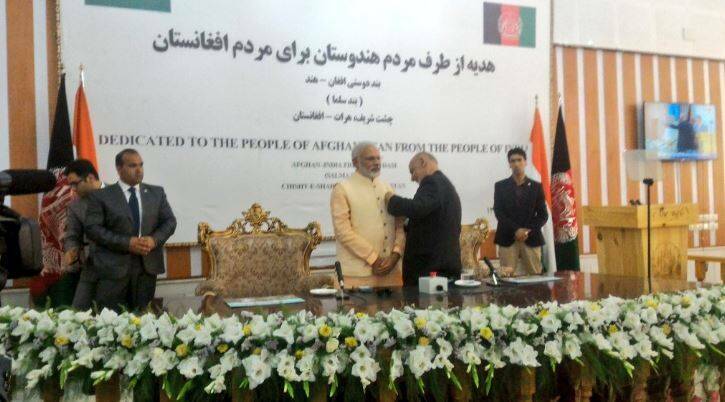 Narendra Modi was awarded with the Amir Amanullah Khan Award, Afghanistan's highest civilian honour. Prime Minister Narendra Modi was on Saturday conferred with Afghanistan’s highest civilian honour, the Amir Amanullah Khan Award. Afghan President Ashraf Ghani conferred the award on Narendra Modi after the two leaders jointly inaugurated the Afghan-India Friendship Dam, earlier known as Salma Dam, that was rebuilt with India’s aid. “A true brotherhood honoured. PM is awarded with the Amir Amanullah Khan Award, Afghanistan’s highest civilian honour,” External Affairs Ministry Spokesperson Vikas Swarup tweeted. Modi arrived in Herat earlier on Saturday on the first leg of his five-nation tour. He will leave for Qatar later in the day on the second leg of his tour.